ORLANDO, Fla. – Among the numerous awards and honors bestowed at the 2013 U.S. Track & Field and Cross Country Coaches Association (USTFCCCA) Convention were a pair of special awards honoring long service and dedication to the sport. 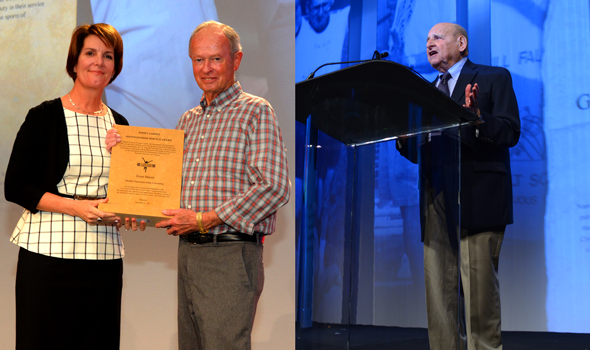 Bill Falk, founder of MF Athletics and a long-time pole vault coach and clinic coordinator, was honored with the George Dales Award prior to the USTFCCCA Hall of Fame Induction Ceremony Monday, while long-time Middle Tennessee State head coach Dean Hayes was honored Tuesday with the Jimmy Carnes Distinguished Service Award during the Convention’s opening session. A long-time fixture in the Rhode Island track & field scene, a national expert in the pole vault and an innovator in specialized track & field equipment, Bill Falk was honored with the 2013 George Dales Award. Falk was inducted into the Rhode Island Athletics Hall of Fame in 1985, where he was the head coach of track & field for 18 seasons. During that time he won five New England Coach of the Year awards while guiding five All-Americans, five IC4A champions and 20 New England champions. As the founder of track & field equipment retailer MF Athletics and the host of countless track & field clinics throughout the years for both coaches and athletes, Falk has continued to make a significant impact on the sport following his time at Rhode Island. Still going strong in a nearly 50-year tenure at Middle Tennessee State that has included numerous roles in the USTFCCCA and the preceding USTCA, Dean Hayes was recognized Tuesday during the Opening Session with the Jimmy Carnes Distinguished Service Award. His men’s and women’s teams in track & field and cross country teams at MTSU have captured a combined 47 conference titles between the OVC and Sun Belt, and mentored nearly 50 different student-athletes to 85 All-America honors. His teaching has gone far beyond his Murfreesboro campus, having served also served many times as a Symposium speaker for the USTFCCCA Convention. From 1981 through 1983 he served as the president of the Division I Track Coaches Association, and since he has served on a number of USTFCCCA committees.